Choy Sum with Oysters Sauce is a quick and simple vegetables dish. Choy sum is a Chinese flowering cabbage or also known as Chinese mustard leaves. It is one of the more popular Chinese vegetable in Singapore, Malaysia and Indonesia. Choy sum with oysters sauce is prepared by blanching the vegetables and serve with oysters sauce. 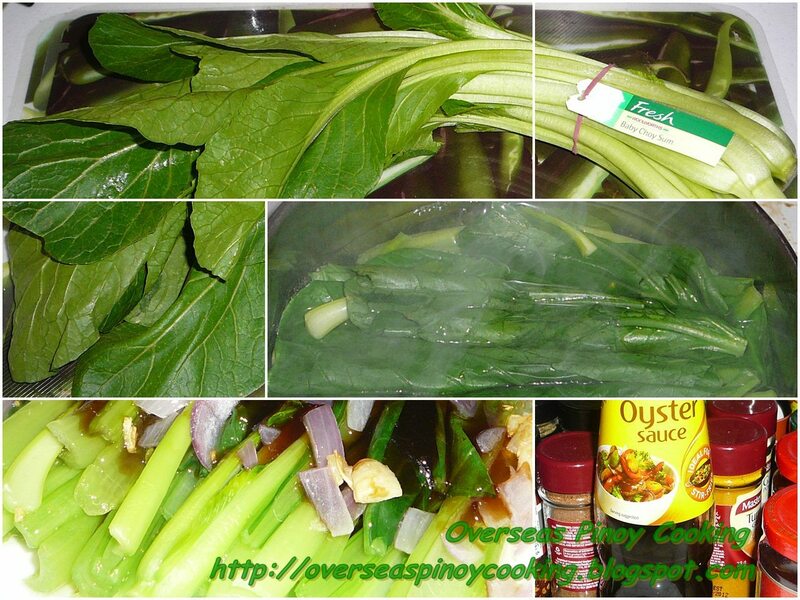 Here is the recipe of choy sum with oyster sauce. In small pot fill with water to half full and bring to a boil. Once it starts to boil add the salt and 1 tbsp. of the cooking oil. Add choy sum stalks into the boiling water, let boil for 10 to 15 seconds. Add the choy sum leaves and continue to boil for another 5 to 10 seconds or until the leaves have turned to dark green (do not over cook) remove the choy sum from the pot, drain and arrange on a platter, keep aside. In a small frying pan heat the remaining cooking oil, add in the garlic and onion sauté, until fragrant when done pour over the platter of blanch choy sum, followed by the oyster sauce. Serve as a side dish.